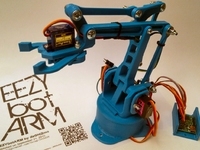 Universal DIY Robot with Arduino by kogyikaunghtet is licensed under the Creative Commons - Attribution - Share Alike license. These are 3D printed parts and CorelDraw File for laser cutting. To laser cut, please use 3mm plywood or any color acrylic sheet. 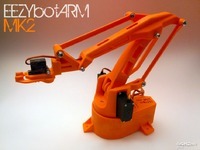 In this project, students will learn the basics of robotics. During the activity, they will know Arduino C programming basics and the functions of the various components. And they will learn the main differences between input and output devices, understand the concept of electrical signal, voltage and current. This is a simple way to introduce students to Robotic and Programming. After completing this activity, students are much more comfortable with Arduino C Programming and the functions of the various components. 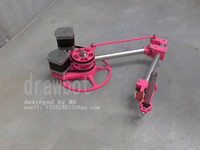 In this project, I modified a SG90 servo motor to rotate continuously 360 degrees. So, you need to make small modification to the gear of servo motors. You will need to find some tutorials to modify a servo motor. OR I will upload soon. Before starting this project, the teacher will have to make sure that the computers used have Arduino IDE. For this project, students will have to be understand about the dangers of electricity (short circuits, polarity reversals, etc.). I uploaded all the Arduino programs, Instructions and Circuit Diagram needed for (bluetooth control robot, line following robot and obstacle avoidance robot) in the Arduino_Program.zip file. If you change pin diagram, you will need to write a new one. Say thanks by giving kogyikaunghtet a tip and help them continue to share amazing Things with the Thingiverse community.